Samsung hasn't been one to shy away from trying new form factors for existing product segments. We saw it with the introduction of the Galaxy Note smartphone line, and we are seeing something of a similar experiment in the tablet market. While this isn't the first "jumbo" Android tablet released by a major OEM as we've seen others like the Toshiba Excite 13, this is probably the most serious attempt at introducing the form factor to the masses. The NotePro and TabPro 12.2 will be available in WiFi, 3G and LTE variants with the first two being equipped with a Samsung Exynos 5 Octacore processor while the LTE variant will sport a Qualcomm Snapdragon 800 Quad core processor. Both variants will also be sporting a 12.2-inch WQXGA (2560 X 1600) Super clear LCD, 3GB of RAM, 8MP Cameras, 32/64GB Internal Memory (Upgradeable by 64GB via microSD card), 9500mAh batteries and of course the NotePro will have S Pen Capabilities. The TabPro 10.1 will also be available in WiFi, 3G and LTE variants and again the first two being equipped with a Samsung Exynos 5 Octacore processor while the LTE variant will sport a Qualcomm Snapdragon 800 Quad core processor. It will also have a 10.1-inch WQXGA (2560 x 1600) Super clear LCD, 2GB of RAM, an 8MP Camera, 16/32 GB Internal Memory, microSD (Up to 64GB) and a 8220mAh battery. The TabPro 8.4 well also be available in WiFi, 3G and LTE variants but in this case will sport a Snapdragon 800 2.3 GHz QuadCore on all three variants. Surprisingly the TabPro 8.4 will also be rocking the same resolution but more pixel dense (359 DPI) 8.4-inch WQXGA (2560x1600) Super clear LCD. It will also have 2GB of RAM, an 8MP Camera, 16/32 GB Internal Memory, microSD (Up to 64GB) and a 4800mAh battery. All four will ship with the latest version of Android 4.4 KitKat. No word on Canadian Availability, but as usual we would be shocked if none of these tablets made it to Canada. 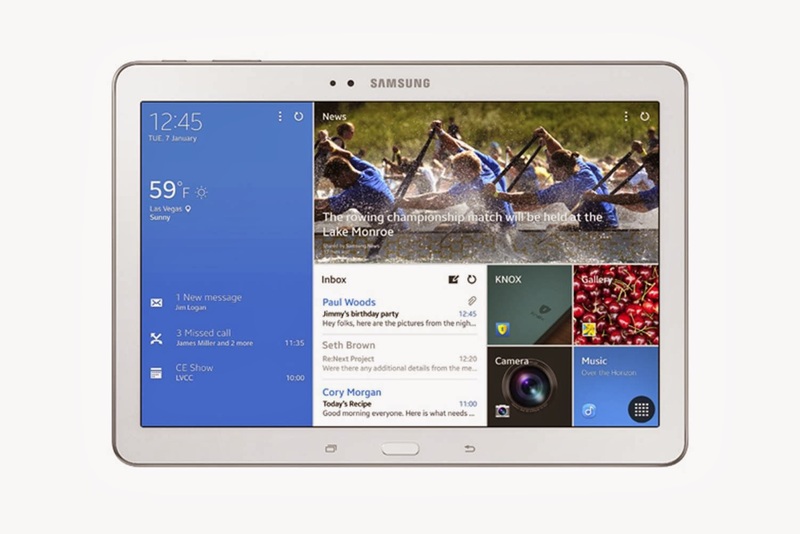 Introducing Galaxy NotePRO and TabPRO (12.2) – the Definitive Tablet Viewing ExperienceThe Samsung Galaxy NotePRO and TabPRO present the world’s first 12.2-inch WQXGA Widescreen (16:10) display, offering crystal clear resolution (2560x1600) with more than 4 million pixels, making it an ideal platform for every type of content creation and consumption. With a larger viewing area, the defined screen allows users to enjoy stunning Full HD video play and view even more information at a glance. In addition to the industry-leading display, the devices have been designed with a sleek, light, slim frame that is both premium and highly portable. Multi Window enables users to split the screen up into four different windows and an innovative, Virtual Keyboardprovides them with enough space to type comfortably, leveraging haptic feedback to produce a more realistic typing experience. 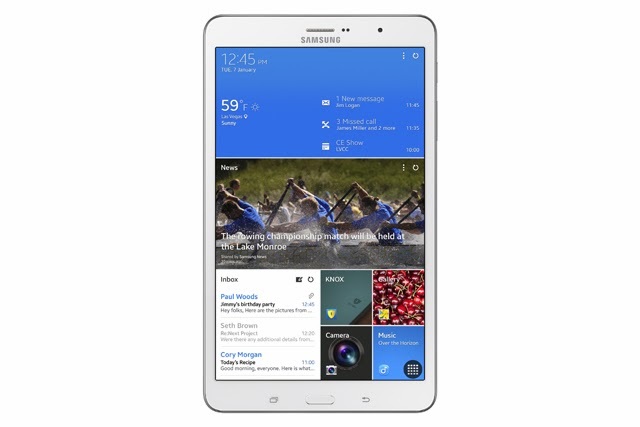 Users can easily access and control their home or office PC directly through their Galaxy NotePRO or TabPRO withRemote PC in order to seamlessly edit and save files remotely. The Galaxy NotePRO and TabPRO also come pre-loaded with Cisco WebEx Meetings platform, the industry’s leading web conferencing solution that provides users with an easy way to meet with anyone, anywhere. And now for the first time on Android tablets, users can share anything on their screen as well as starting a WebEx meeting from contact list.Samsung e-Meeting provides collaboration capabilities by giving users the ability to share content during a meeting without having to access a central server or network. 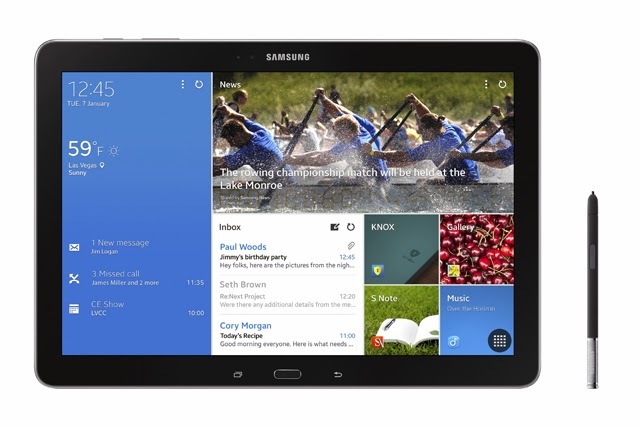 For additional value and productivity right out of the box, the Samsung Galaxy NotePRO and TabPRO (12.2) will feature up to approximately $700 worth of the premium pre-paid, long-term subscription offers from best-selling news, social media and cloud storage providers, including: Bitcasa, Bloomberg Businessweek＋, Blurb, Cisco WebEx Meetings, Dropbox, Easilydo Pro for Tablet, Evernote, Hancom Office for Android, LinkedIn, LIVESPORT.TV, NY Times, Oxford Advanced Learner’s A-Z, and Sketchbook Pro (content packages may vary by region). Designed to extend productivity even further, the following optional accessories are also available for purchase with the Galaxy NotePRO and TabPRO: Various Book Covers, USB LAN HUB, Universal BT Keyboard and S Action Mouse(accessories may vary by product model). 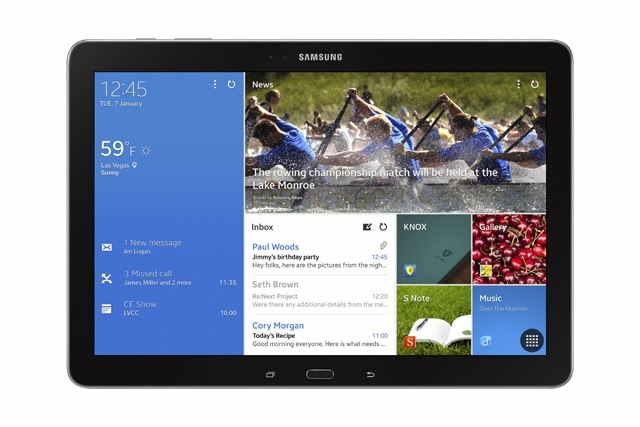 The Samsung Galaxy NotePRO and TabPRO will be on display at the Samsung booth #12004 at CES 2014, January 7th through 10th, 2014. ＊ The services listed above may not be available in all regions and features may vary by region. Also, service provider may change the name and/or value of its application at any time. ＊＊All functionality, features, services, applications, specifications, and other product information provided in this document including, but not limited to, the benefits, design, pricing, components, performance, availability, and capabilities of the product are subject to change without notice or obligation. About Samsung Electronics Co., Ltd.Samsung Electronics Co., Ltd. is a global leader in technology, opening new possibilities for people everywhere. Through relentless innovation and discovery, we are transforming the worlds of televisions, smartphones, personal computers, printers, cameras, home appliances, LTE systems, medical devices, semiconductors and LED solutions. We employ 270,000 people across 79 countries with annual sales of US$187.8 billion. To discover more, please visitwww.samsung.com.